Chevron Amethyst is a calming, comforting and protective stone, which is ideal for meditation and enhancing psychic abilities. Amethyst radiates divine love. 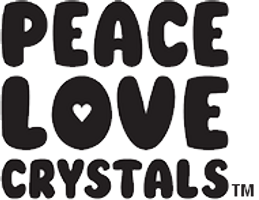 PEACE LOVE CRYSTALS Chevron Amethyst Angel is approximately W24mm x H38mm x D13mm in size and weighs 14grams. This Chevron Amethyst Angel comes with a protective pouch and free copy of our "Crystals & Minerals Metaphysical Properties Guide"*. Also, the images shown is the actual Angel you will receive, so pick the one you love best. Chevron Amethyst is a purple and white form of crystallized quartz. The colour comes from the combination of trace amounts of iron and aluminium, plus irradiation. Chevron Amethyst has a trigonal crystal structure, a hardness of 7 and its chemical formula is Silicon Dioxide - SiO2.